"May your smile light up the heavens above." "Frank, Jelleke, Ryan, Kimberly, Simon, my heart goes out to you all. Owen, I’m so glad I met you when I did. It was a great privilege..."
"Our deepest sympathy to your family." "Sending God's love to you Ryan and your family." "Our deepest and heartfelt sympathy during this tragic and difficult time ." "Our deepest condolences on the passing of Owen. He was a brave soul and a wonderful inspiring dancer. 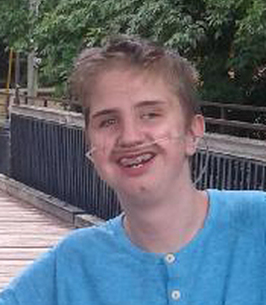 On behalf of everyone at Listowel..."
Owen Sluys ~ At Victoria Hospital, London, on Sunday, August 12, 2018, Owen Thomas Sluys of Listowel, at the age of 15. Beloved son of Frank and Jelleke (VanderGoot) Sluys, and much loved brother of Ryan Zijlema, Kimberly Zijlema and Jordan Dreise, and Simon Sluys. Grandson of Wayne and Corrie Sluys of Atwood, and Jurjen and Elly VanderGoot of Trowbridge. Owen was loved by his aunts and uncles; Jerry and Wilma Sluys of Chepstow, Jacqueline and Ron Knop of Bluevale, Wen Sluys and Alison Clark of Clinton, Mark Sluys and Amy Emond of Listowel, Ed and Jen Sluys of Richmond Hill, Petra and Jelly VanderGoot of Holland, Walter and Ella VanderGoot of Atwood, Jacqueline and Bert Meijering of Trowbridge, and Nienke VanderGoot and Jason Griffith of Listowel, and by his many cousins. A time of mingling will be held at the Listowel Evangelical Missionary Church on Wednesday, August 15, 2018 from 12:00 p.m. until the time of the Celebration of Owen’s Life at 2:00 p.m. Pastor Carter Whyte officiating. PLEASE DRESS CASUALLY. Memorial donations to Listowel Memorial Hospital Foundation, Children’s Hospital of Western Ontario (Children's Health Foundation), or to a charity of one’s choice would be appreciated, and may be made through the Eaton Funeral Home, Listowel. It was such an honour to be able to participate in the celebration of life for Owen! I want to pass along my condolences to your family. My thoughts and prayers are with you all. Frank and Family: We are so sorry to hear of your loss. Please know that our thoughts and prayers are with you all at this most difficult time. Thinking of you at this difficult time. Our thoughts and prayers are with you.